Dr. Youssef Tahiri is a Board-Certified Plastic and Reconstructive Surgeon with a subspecialty in Craniofacial Surgery. After graduating from McGill Medical School, in Montreal, Canada, he completed his Plastic and Reconstructive Surgery residency at McGill University and became certified by the prestigious Royal College of Physicians and Surgeons of Canada as well as the American Board of Plastic Surgery. 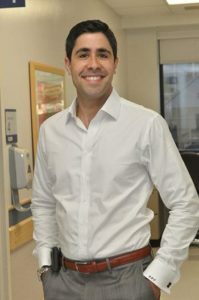 During his residency, he demonstrated his commitment to research and academia by pursuing a Masters Degree in Experimental Surgery, which he obtained with Honors. Dr. Youssef Tahiri is a highly respected pediatric craniofacial surgeon who was hand selected by Dr. John Reinisch to partner and continue his practice of Microtia reconstruction. Dr. Tahiri embraces the most innovative, cutting-edge technique available in craniofacial and microtia surgery. In addition to Microtia, he performs complex craniomaxillofacial procedures including Cleft Lip and Palate, Cranioplasty, Craniosynostosis Surgery, Jaw surgery, among others. You can visit his other website tahiriplasticsurgery.com to read more about the other procedures he routinely performs. Dr. Tahiri is a world leader in Microtia Surgery. Our compassionate, professional staff will guide you and your family through the entire Medpor surgery process, from assisting you with your travel plans to Los Angeles to answering any questions you may have about the procedure or post-op care. Please contact us any time if you have any questions. Your feedback is always appreciated, as it helps us provide you with the best possible care and service.